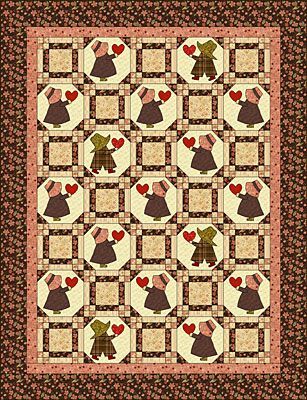 Here's My Heart is a 64" x 84" quilt pattern made with 18 patchwork quilt blocks and 17 Snowball blocks that feature appliquéd Sunbonnet Sue and Overalls Sam. Blocks finish at 10" x 10". Use any appliqué technique to affix the kids to the Snowballs, including the quick-fuse method. References to 42" strips refer to strips cut all the way across the fabric's straight grain. If they are longer, you might need fewer strips. If the strips are shorter, you will need additional strips for some cuts. Yardage recommendations are generous, but it's nearly always a good idea to buy just a bit more to cover shrinkage and potential cutting errors. Read through the entire pattern before beginning, and always begin any pattern by cutting just enough fabric to make sample blocks. See a close-up of the block on page 4. Backgrounds are cut oversize, and squared up after appliqué is in place. Strip piecing helps the Share My Heart quilt go together fairly quickly. Bar units, made from a light fabric and a dark fabric, surround the quilt block's center square. Sew a light striped 1-3/4" x 42" fabric strip lengthwise to a chocolate brown strip of the same size. Press seam allowance towards the chocolate strip. Square up one end of the strip set and cut as many 5-1/2" segments from it as possible (seven minimum). Make additional identical strip sets until you have a total of seventy-two bar units. Four-patch units are in block corners. Sew a mauve/pink 1-3/4" x 42" fabric strip lengthwise to a neutral swirled strip of the same size. Press seam allowance towards the mauve/pink strip. Square up one end of the strip set and cut as many 1-3/4" segments from it as possible (twenty-four if strips are slightly longer than 42"). Make additional identical strip sets until you have a total of one-hundred-forty-four units. Sew two 1-3/4" segments together as shown, with like-fabrics diagonal from each other. Press. Repeat to make a total of seventy-two four patch units. Arrange four bar units, four four-patch units and one 5-1/2" square as shown to form three rows. Check color placement carefully. Sew components in each row together. Press seam allowances towards bar units. Sew rows together, butting seam intersections for a perfect match. Press. The block should measure 10-1/2" x 10-1/2". Repeat to make a total of eighteen patchwork blocks. Before you begin, download the PDF file. The file includes all templates for the Sue and Sam quilt blocks, and outlines of each completed unit to use as a layout guides. The guides illustrate where patches overlap. Templates are printed right side up. Cutting methods differ for various appliqué techniques, and some pieces in blocks must be mirror images of each other to make figures face different directions. Consider orientation when you cut asymmetrical pieces. Templates do not include seam allowances. The quilt is made with 17 applique blocks -- combine Sue and Sam in any way you wish to reach that total. Use the quick-fuse method or any other technique you wish to appliqué the motifs to the 13" squares. Fold each 13" square in half along both straight edges, then again diagonally. Lines should intersect at the block's center. Keep the designs centered within the square. Appliqué patches to squares using the technique of your choice. Press. Square up each block to measure 10-1/2" x 10-1/2", keeping Sues and Sams centered in the block. Use the quick corners technique to sew a 3" x 3" chocolate square to each corner of each block. Press. Referring to the illustration on page 1, arrange the blocks into seven rows, alternating block types as shown. Sew blocks in each row together. Press seam allowances towards the Chain blocks. Sew rows together. Press. Sew straight borders on the quilt. Use 2-1/2" wide strips for inner border and 5-1/2" wide strips for the outer border (border instructions). Sandwich the quilt with batting and backing. Quilt by hand or machine. Trim and square-up excess edges and sew binding strips around the quilt edges. This close-up view of the Sue & Sam Chain block might help you select fabrics.